Red's Shoe Diaries: My My My My My Derby Shoes! Can I really launch a shoe blog with a post about...Hats? I woke up with the idea at 3 am this morning and decided, "Why not?!" I've been kicking around the idea of a footwear-focused fashion blog for some time now (pardon the pun and the alliteration - sometimes I can't resist), but couldn't decide how to begin. However, with the recent encouragement of friends and a seasoned fashion blogger I recently had the pleasure of meeting, I finally decided to step forward and dip my toe in the blogging waters. (I promise I won't make bad puns in every post, lest would be readers think I'm a heel. Really, I can stop). 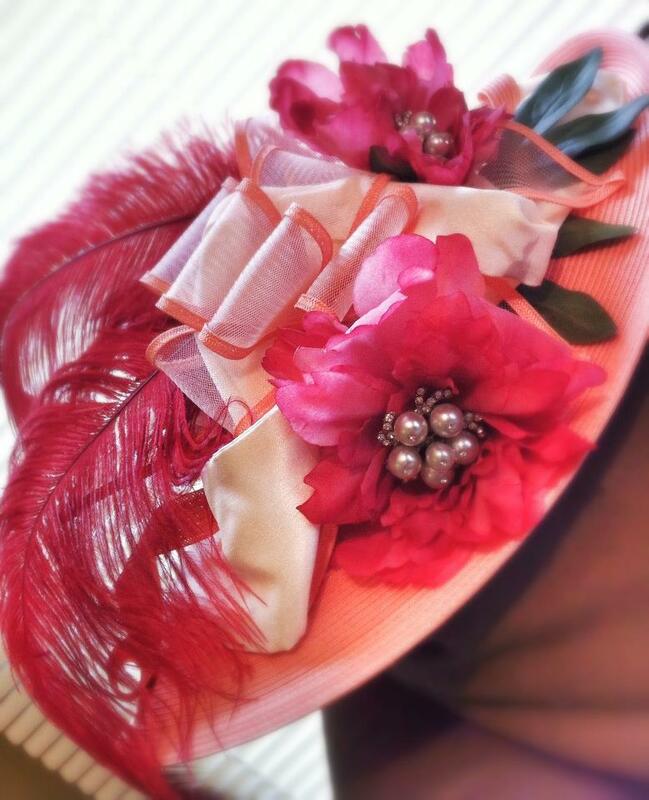 You can view pictures of other fabulous hats from the Hats Off luncheon on the Dressed Her Days Vintage blog, and in Cathy Kightlinger's upcoming Talk of Our Town piece in the Indianapolis Star. This was my first time at the Hats Off Luncheon, and I was head over heels happy to be awarded the "Hatastique" award for best all around ensemble, though I was really impressed and inspired by the effort put in by all the attendees to put their best foot (and hat) forward. Despite its midwest pedigree, Indianapolis does, in fact, have a lot of style! When I told my husband that I won a prize, he said "Of course you did." Being far wittier than me and highly skilled with a good pun, I'm surprised he didn't say I was a "shoe-in!" Speaking of shoes, the ones I chose for the luncheon are a favorite. I purchased them last summer at Rack Room for a steal. I liked them so much, I bought a second pair in a BOGO deal, which I then customized to coordinate with a different dress, but more about that pair and how to customize basic shoes in a future post. For me, style is in the details, and finding the right elements to perfectly coordinate dresses, shoes, and hats was a lot of fun and easy to do with a little hot glue and some hat clips. The band on my Oaks Day hat is actually the fabric belt that came with the dress - it adds a touch of coordinated ivory to the hat, and I added a $4 pink stretch belt from eBay to add a bit more contrast at the waistline of the dress. When I stumbled upon the brown and white Ralph Lauren polka dot dress in April, I immediately thought, "It's the Pretty Woman dress! (remember the stomping of the divots scene?!) It's timeless and I think I'll be wearing it for years to a variety of events, and probably even to work (sans hat). Unfortunately, it rained nearly the entire day of the Derby, so the white peep-toe pumps actually never made it out of the car. Instead, my toes stayed warm, dry and comfy in these horse print rain boots (Look for a post dedicated to fun and stylish rain boots in the future). I've learned from past Derby Day experience that balancing comfort and style is an absolute must. When my feet hurt, I'm miserable, and life is too short to be miserable! By the way, you may have noticed the fantastic spectators my husband is sporting in these photos. He hasn't worn these anywhere other than the racetrack, but I absolutely love them. In fact, spectators in all shapes, heel heights and colors are my favorite style of shoe and I have collected multiple pairs over the years. Look for a future post dedicated to the beauty of the spectator! Thanks for reading! I hope you'll visit again and take a walk in my shoes! Love the new blog. Can't wait to read future posts! Bravo, bravo, bravo, Jody! Thank you for the mention. The feathers, the flowers. Girl, you've got it all. Congratulations on getting started. Let's be blog buddies!